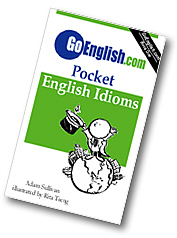 Today's Idiom = "Like Two Peas In A Pod"
"Like Two Peas In A Pod"
Two things that are similar and go together well are like two peas in a pod. Example: "He and his sister are like two peas in a pod." Peas fit together comfortably in a pod where they grow, and two people who get along well together are like two peas in a pod. Example: "Your brother and his wife are so happy and comfortable together." Reply: "They are like two peas in a pod." "Jenny and Forest were like two peas in a pod."